The Box offers the beauty and solitude of southern Utah canyons without the sweltering summertime temperatures. Starting from the “Upper Box Access” sign, walk south down the grassy slope to the right of the road. Don’t worry if you miss the faint footpath leading down to the proper trailhead. The creek runs just off to your left; follow it to the trailhead sign, which will be visible a short way downhill. You should have no trouble navigating, as the trail simply follows Pine Creek. Stream crossings are numerous, obvious, and rarely above shin-deep. Wear shoes you don’t mind getting wet and be mindful of the weather, particularly the possibility of rain. Continue along the soft, pine-needle-paved trail that parallels the right bank of the creek. 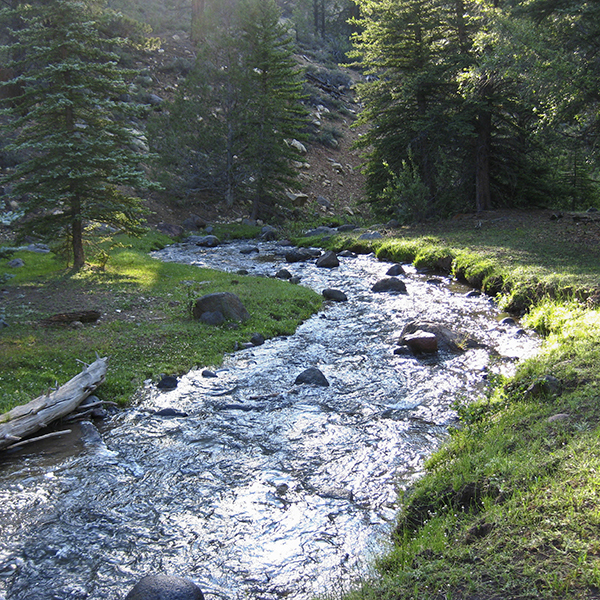 You reach the first of many stream crossings about a thousand feet past the trailhead. Shortly thereafter, pass through a cattle barrier and proceed downstream. 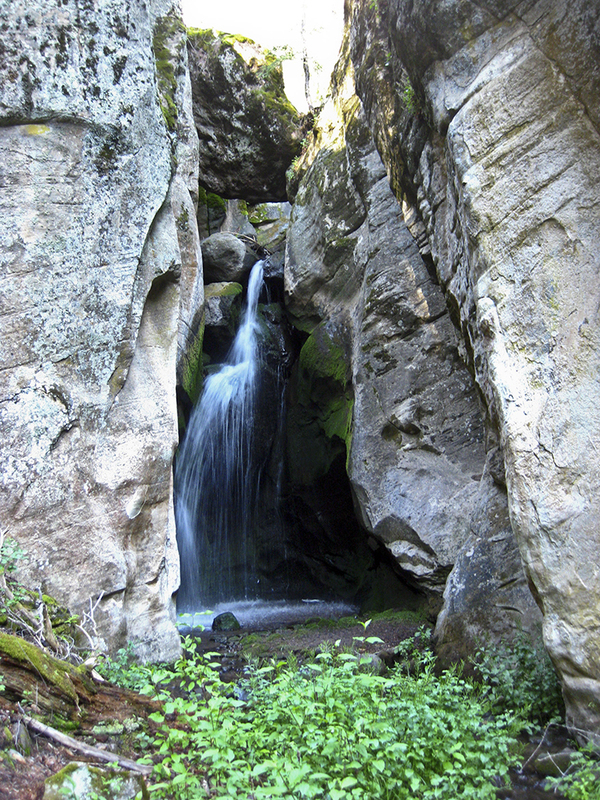 A quarter-mile into the hike, start scanning the right canyon wall for a cascading waterfall tucked in an alcove—well worth the bushwhack to cross the stream and explore up close. At 0.7 mile, the trail enters the Box-Death Hollow Wilderness area where a wooden sign marks the boundary. For the length of the hike, the trail undulates along either side of the creek. You begin to see good campsites starting as early as 1.5 miles; opportunities for camping continue throughout the hike. You could opt to do this hike as an overnight trip, which would allow you to explore some of the side canyons and drainages like the one about 2 miles in. Be sure to pack out all garbage and follow leave-no-trace practices to keep The Box looking pristine. Miles pass quickly among the ponderosa pines and occasional aspen trees. 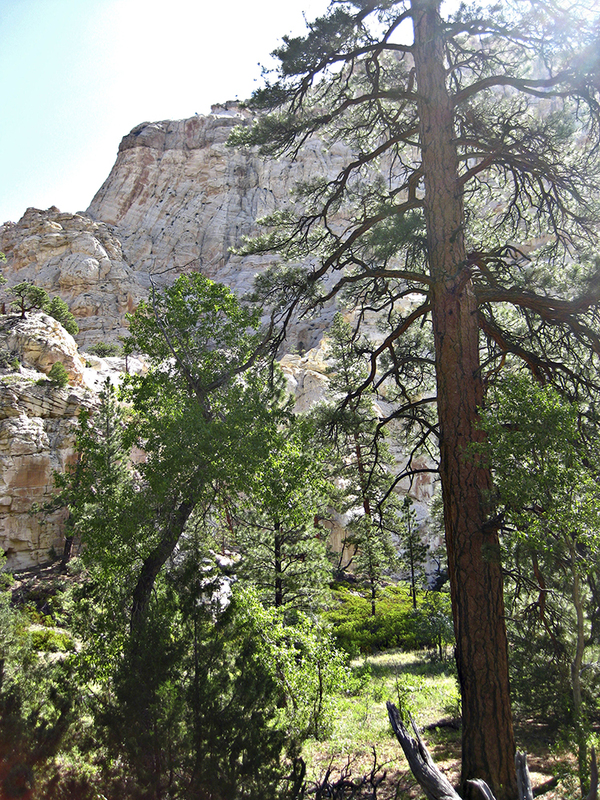 Around 3 miles, the canyon widens and the rim stretches even higher above you. 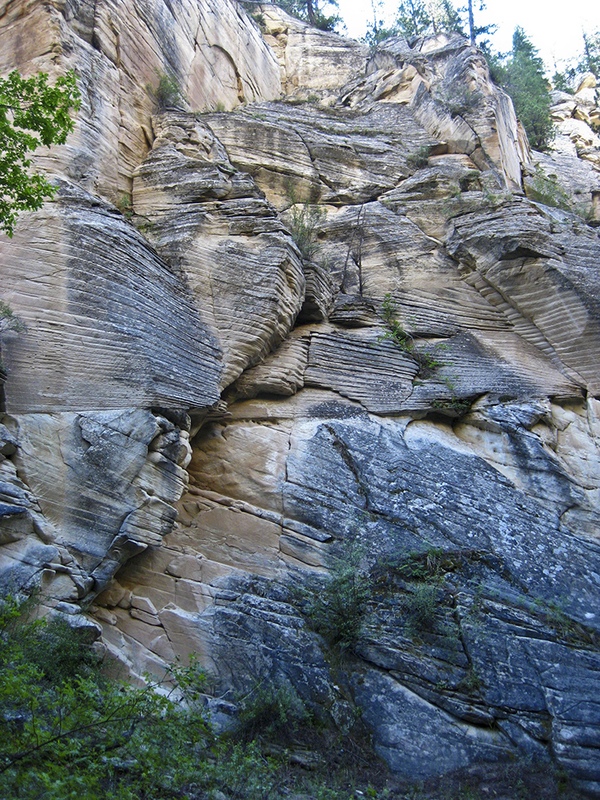 While the orange-gray sandstone walls average 800 feet high, they reach 1,400 feet at their highest point. Deep Creek flows in from the right at 4.5 miles. In the last few miles, the trail crosses several rocky side drainages. The summer monsoon season brings debris and sediment flows down seasonal waterways, changing the configuration of the creek slightly with every rain. Don’t camp at these side canyons during rains. 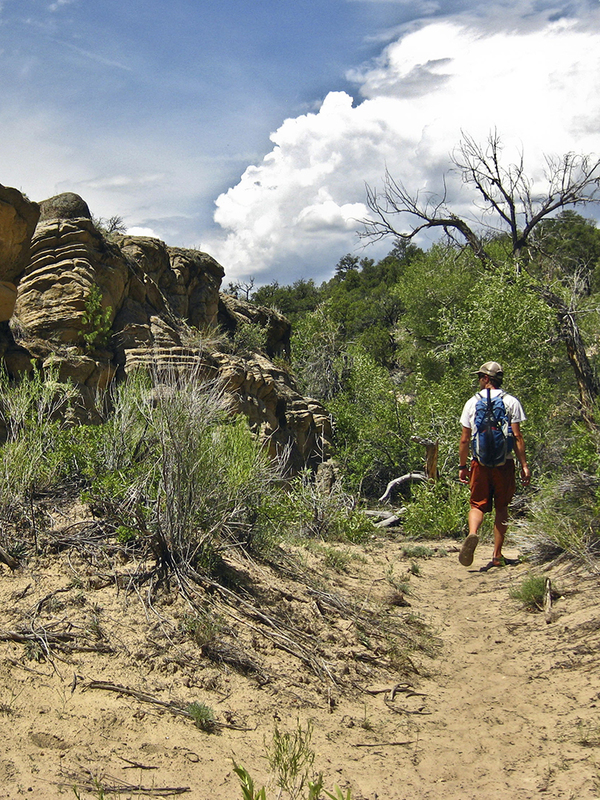 At 8.8 miles, cairns mark the path across a slickrock slope and guide you up a rock pile. The final stretch of trail brings you through a slot in the cliffs for your exit. Walk through a cattle fence just before arriving at a wooden gate around 9.5 miles. The lower trailhead sign is to your right, at the edge of the gravel parking lot that is no longer accessible by car. Having lost over 1,400 feet of elevation along the hike, you’ll notice that the vegetation at the lower trailhead differs drastically from the higher elevations. Instead of aspens, pines, and spruces, you are in sagebrush and scrubland characteristic of canyon country. Walk the rest of the way up the road to your shuttle vehicle. Presented here as a point-to-point hike, you will need to set up a shuttle and leave vehicles at the upper and lower ends of the trail. If you have neither the time nor vehicles to thru hike, you can explore the canyon as an out-and-back hike from either trailhead. To get to the lower trailhead, drive east through the town of Escalante on UT 12, and turn left (north) on 300 E. This road forks at 0.7 mile, and you stay right at the junction. Continue along this road, FR 153, for both trailheads. You see a sign for Lower Box at 7.4 miles, where you turn right on a gravel road. A permanent “road closed” sign blocks your progress, as the road has eroded to the point that a high-clearance vehicle can’t make it through the wash. Instead, park in the gravel lot close to the main road. Continuing on FR 153 for the upper trailhead, drive until you reach a signed junction at 13.2 miles. Turn right towards Hells Backbone Bridge to stay on FR 153. At 14.3 miles, you pass over Deep Creek and see the “Upper Box Access” sign around 17.4 miles. Pull off the road here and park on the shoulder close to the sign.